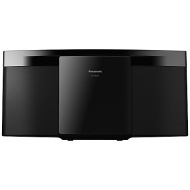 alaTest on kerännyt ja analysoinut 96 arvostelut tuotteelle Panasonic SC-HC297EB-K DAB+/FM Bluetooth Compact All-In-One Hi-Fi System with USB Playback and Wireless Audio Stream. Keskimääräinen antama arvosana tälle tuotteelle on 4.5/5, verrattuna keskimääräiseen arvosanaan 4.1/5 kategoriassa Audiolaitteet. Me analysoimme käyttäjien ja ammattilaisten antamia arvosteluita, tuotteen ikää ja muita seikkoja. Verraten muihin tuotteisiin kategoriassa Audiolaitteet, Panasonic SC-HC297EB-K DAB+/FM Bluetooth Compact All-In-One Hi-Fi System with USB Playback and Wireless Audio Stream on saanut alaScore™-arvosanan 89/100 = Erittäin hyvä. Bought for our conservatory to primarily play CD's. . It's just the right size, very modern looking and no wires all over the place. The sound quality is very good. Looks good and great sound, good value, well worth the money. A very good system that utilises all forms of sound media. Very neat and tidy. Easy to set up. Suits my needs. Very easy to use. Great sound, compact and easy to use! I wanted a good clear radio but this does so much more,its such a good clear sound as well and easy to use as I hate technology . Great looking,easy to use,great sound and very good price what more could you want.